Ms. Burke is a Second Grade teacher for Divine Wisdom Catholic Academy. This is her second year teaching at Divine Wisdom. Previously, she worked as a Special Education Teacher’s Assistant. She has her Bachelors of Science in Elementary Education from Molloy College, as well as her Masters of Science in School Counseling (grades K-12) from Queens College. 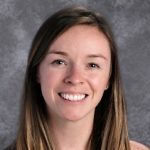 Ms. Burke enjoys warm weather activities, such as, relaxing on the beach, riding her bike, dining al fresco, and traveling to warm places! Ms. Burke’s believes that every child is capable of success. She plans to cater to each child’s individual needs by providing them with an educational environment that is encouraging and positive. She strives to make the learning process fun and rewarding for the students. She is honored and excited to begin a new school year at DWCA.